Many devotees are trying to understand the circumstances around Srila Prabhupada’s disappearance and at www.krishna.org we thought it appropriate to present Srila Prabhupada’s own comments to more clearly understand these issues along with sections of the diary of Anantacarya Das. This is a historical report. Prabhupada: Don’t move me to the hospital. Better kill me here. Prabhupada: But if you are disgusted, that is another thing. Prabhupada: Someone says that I’ve been poisoned. It is possible. Kaviraja (doctor): What is he saying? Prabhupada: Someone says that someone has given poison. Kaviraja: Who would give you poison? Why would anyone do that? Prabhupada: I do not know, but it is said. Kaviraja: Maharaja, how did you say this, that someone has said that someone has poisoned you? Have you felt something? Prabhupada: No, not said, but when one is given poison, it happens like this. It’s written in book. Kaviraja: If you take raw mercury, it can happen, or several other raw things. But who would do such a thing to you? For a saintly person like you, even if someone thinks such a thing, he is a demon. Tamal Krsna: Srila Prabhuapda? You said before that you…, that it is said that you were poisoned? Prabhupada: No. These kind of symptoms are seen when a man is poisoned. He said like that. Not that I am poisoned. Tamal Krsna: Did anyone tell you that, or you just know it from before? Tamal Krsna: Ah, I see. That’s why actually we cannot allow anyone else to cook for you. Prabhupada: My Guru Maharaja also. Bhakti-caru: What was this all about mental distress? Kaviraja (Doctor): Say it. Say it. Prabhupada: The same thing. That someone has poisoned me. Kaviraja: Look, this is the thing, that maybe some rakshasa (demon) gave him poison. Bhakti-caru: Someone gave him poison here. Tamal Krsna: Prabhuapda was thinking that someone had poisoned him. Tamal Krsna: That was the mental distress. Kaviraja: If he says that, there must definitely be some truth in it. Tamal Krsna: What did Kaviraja just say? Bhakti-caru: He said that when Srila Prabhupada was saying that, there must be some truth behind it. Tamal Krsna: Srila Prabhupada, Sastriji (Doctor) says that there must be some truth to it if you say that. So who is it that has poisoned? Kaviraja: The strongest poison is mercury. Kaviraja: No. No. Swamiji, did you read about Svarupa Guha? In Calcutta. Bhakti-caru: He knows nothing of this, he has never heard. Kaviraja: The husband poisoned the wife, gave a dose of raskapoor. There is medicine for it. Kaviraja: No. No. Not that mercury. Another form of mercury. Bhavananda: What did he say? Bhakti-caru: No. He’s saying not that. Kaviraja: It is very poison. Bhavananda: What was he talking Prabhupada? Kaviraja: Makaradhvaja is like nectar, although not suitable for him. But that (raskapoor( is poison for everyone. Prabhupada: I wish that you GBC manage very nicely and consider that I am dead and let me try to travel to all the holy places. Without any responsibility. If I recover from this malady… Bring little medicine and no medicine, and travel, one place to another, and if there is death, what is the lamentation? My age is ripe. In the open air and bullock cart or during daytime, eh? Or you can say semi-suicide, although living what consider me dead for the time. You manage. Nowadays there is in India ample sunshine. So during daytime I shall travel and at nighttime you make a camp under a tree. In this way let me travel to all the tirthas [holy places]. I am thinking in this way. What is your opinion? Bhavananda: Srila Prabhupada, we promise that we’ll manage everything to the best of our ability. Prabhupada: No, no, you are managing, I know, but you are all important men and unnecessarily you are bound up. You cannot go. So Lokanatha party has got some experience and let me go. In India the climate is now good. If I recover it is very good. You know. So what is the wrong? If I die then the body will be brought either in Vrindavana or Mayapur, that’s all. And if I live it will be a great end of life. You are all experienced… What is the use of lying down here? Jayapataka: That kaviraja said that your body has got a life of six to ten years. But he said even a healthy cow, if it’s kept locked up inside of a room, then it will detoriate. Prabhupada: And therefore I say, (laughs), don’t keep me locked up. You do your duty as I have trained you and let me be free and if money required, he’ll [Lokanatha] come and take and go back as he is coming to take book. Devotee: Previously it was mentioned that there was some risk in traveling. Prabhupada: This is my proposal. If I have fresh air and free movement and sunshine then I can come back in a year… Then when I am sane man I shall come back to either Mayapur or Vrindavana or Bombay… You have tried doctor, kaviraja, medicine, everything. Everything has failed. Now, suppose I am taking the risk of death, what is wrong?… I will take milk. Milk is available everywhere. If I live, that’s all right. If I don’t live, that doesn’t matter. Jaypataka: For you Srila Prabhupada, to be alive or to die is no different because you are in the transcendental position, but for us when you leave the body we are bereft of your association. So for us it is very unfortunate. Prabhupada: Then live by my words, by my training. Mm. So you like this idea? Prabhupada: So they will see me. I have no objection. I want a little milk from them, that’s all. So far my presence is required for management, I think I have bequeathed, properly you can manage. Hm. It is to be admitted failure, the so-called medical treatment, failure. Prabhupada: You all seriously consider this submission and let me go. Hamsadutta: You want to begin tomorrow morning? Devotee(1): If Prabhupada travels in a van it would be very bumpy. He should have a big bus. Prabhupada: No. No. Bus will not be good. Bullock cart. Jayapataka: In this part of India it’s very cold now for Your Divine Grace. Tamal Krsna: You sound like you are very determined to go, Srila Prabhupada. Prabhupada: Daytime we expose in the sunshine, and camp underneath a tree at night. That has to be arranged. Svarupa Damodar: Lokanatha has already gone, Srila Prabhupada. Hamsadutta: He has gone to Matura for renting. Tamal Krsna: He has gone out for renting the bullock cart. Tamal Krsna: Lokananta says that the bullock cart could probably go around Vrindavana in about five to six hours, parikramming Vrindavana town. Hamsadutta: Does it mean that Your Divine Grace will come on the experiment, or should we go without Your Divine Grace and experiment? Jayapataka: To see if the road is very rough, if the road is passable by bullock cart the whole way. Tamal Krsna: Bullock cart is not smooth. How would you propose that we go, Srila Prabhupada? Tamal Krsna: Go anyway. Let us take the risk. Prabhupada: So let us make the experiment in Vrindavana. 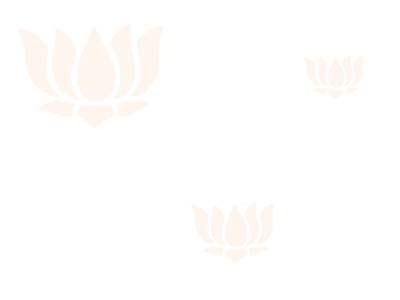 Bhakti-caru: Shastriji’s saying that he shouldn’t do it under the circumstances. Bhavananda: Srila Prabhupada if we follow the kaviraja’s instructions and advice, then he feels that within fifteen days, twenty days you will have strength. To take an unnecessary risk at this time we have to practically appraise what will be the loss. You have said, “If I live or die on this parikrama, it will be glorious,” but the loss will be that Srimad-Bhagavatam will not be finished, so many works will be unfinished. It is just a matter of being a little patient and waiting fifteen more days—it is only two weeks—then when you have strength, then we can all go on the parikrama, and you’ll be able to hopefully gain more strength and finish up all of these works. But I think that the risk, in terms of the future of the world, is too great. Prabhupada: Vrindavana parikrama is not risk. Svarupa Damodar: As your humble disciples, Srila Prabhupada, we are ready to take any instruction you have given us, but at the same time you have advised us many times that we shouldn’t take unnecessary risk. Just like a few days ago you were telling a Bengali saying, saying that when you are doubtful, don’t do it. You instructed us. Tamal Krsna: This seems like suicide, Srila Prabhupada, this program. It seems to some of us that it’s like suicidal. Tamal Krsna: Hm. Prabhupada said, “And this is also suicide.” Now you have to choose which suicide. Prabhupada: The Ravana will kill and Rama will kill. Better to be killed by Rama. Eh? That Marica—if he does not go to mislead Sita, he’ll be killed by Ravana; and if he goes to be killed by Rama, then it is better. Tamal Krsna: Prabhupada says he thinks he will be cured by the parikrama. Hamsadutta: Under the circumstances we have to consider whether Prabhupada’s opinion is more or less than the kaviraja’s, is what it comes down to. If Prabhupada says that by going on parikrama he feels he’ll be cured, then how can we continue to place arguments against him? Tamal Krsna: Ultimately what Prabhupada decides, we will do. Tamal Krsna: Yeah, but it goes on. As Prabhupada goes on, his disciples also go on. Lokanatha: We had a meeting and discussed that if we just go around Vrindavana all will go. But if we keep going from holy place to holy place, then we have to decide whether everyone goes or just a few of us go. Prabhupada: So you are hiring [the bullock cart] for how many days? Tamal Krsna: Yes, Srila Prabhupada? Tamal Krsna: It certainly is an experiment. Of course we always like experiments to be successful. Prabhupada: Yes. Where he’ll go? Tamal Krsna: We thought tomorrow to go around the Vrindavana parikrama path. Bhakti-caru: Lokanatha Swami, you apparently didn’t get one question of Prabhupada. He asked what do you think about this trip. You didn’t answer that. What do you think? In this condition Srila Prabhupada will withstand the trip? You know in what condition Prabhupada is in now. Gopala Krsna: Bullock carts are usually very bumpy. Hamsadutta: The main concern of the devotees is that whether you will be able to survive such an experiment. But before you said that you felt such a parikrama would actually cure you. You said that. So your vision is transcendental, because you are the spiritual master. You’re a pure devotee of Krsna. So if you say that it will cure you and that it will be beneficial for you, then we have to carry out that…, whatever you desire. We do not know, we’re just on the mundane platform. Prabhupada: One day experiment. It is for one day? Prabhupada: Rest assured. I will not die in one day..
Hamsadutta: So we should go to Goverdhana? Because tomorrow is Goverdhana-puja. Hamsadutta: You have assured us that in one day you are not going to die, and you want to make this experiment, so we should do it. Hamsadutta: We’ll do it with great enthusiasm. Your Divine Grace is infallible. So if you say that it will help and cure you, then that must be a fact. You’ve never been wrong about anything, Prabhupada, so you must be right this time also. Prabhupada: So lets make experiment. Don’t hesitate. Svarupa Damodar: I think Lokanatha Swami should make the route, completely planned out, and the place also where we’re going to picnic so that everything has to be arranged well ahead of time. Panca-dravida: Yes. We’ll prepare the cart tonight, Srila Prabhupada. Lokanatha: When we started the bullock cart you said, “Go to the heart of the village,” and we said, “What is the heart?” You said, “Wherever there is well, water, we should camp. We should stay.” That is where we could remain clean. Prabhuapda: That you have experience. I have no experience. Lokanatha: Maybe you sent me to experience this bullock cart program so that you could in the future go on bullock cart. Prabhupada: Yes. For me it is experiment. Make an experiment. Svarupa Damodar: What time should we start? Tamal Krsna: Yes Srila Prabhupada. Tamal Krsna: Well, Srila Prabhupada, I’ll tell you, I’m getting so upset sitting in the room upstairs. I mean I just… I was walking around… Two of the devotees told me this road is so bad that if you go on this road, you’re going to be jolted back and forth. The road is terrible. I just can’t understand, Srila Prabhupada, why it has to be tomorrow that we have to go. If anybody wants you to travel, I do. My whole desire is to take you all over the world. I want to take you on parikrama, but why do we have to go when you’re in this condition? I can’t understand it. It just… I was standing outside. The kaviraja, he has worked so hard. He’s so much disappointed. He can’t understand why he… He says that now, today, you’ve taken half a kilo of milk. No mucus is being produced. No stool is being passed. He says tomorrow he wants to give you a medicine that will begin to build milk into muscles. He’s going to get you to a point where you can take two kilos of milk a day. And he says soon you’ll be able to have the strength to actually do parikrama. So why are we throwing everything out the window, that we must go tomorrow? I cannot understand. Bhavananda: Thank you Srila Prabhupada. During the night, at about 1:00 A. M., I re-enter the room. Srila Prabhupada is resting. Swarup Damodara, one of His personal servants, is tending closely to Srila Prabhupada. Shortly after I arrive, Swarup Damodara is relieved by Bavananda Maharaj who helps Srila Prabhupada turn over in bed. Bavananda begins massaging Srila Prabhupada, and while Srila Prabhupada rests, the room is completely silent. We chant Japa under our breaths. When Bavananda comes close to help, Srila Prabhupada asks, "Who is it?" Later on I find out that some of Srila Prabhupada's associates have talked him out of going on the parikram, and He has agreed that we will go instead. The night is chilly. Today is Govardhan Puja, and later on in the morning the Temple will be decorated. Kaviraj (Shastri-ji, the doctor) comes in at 8:00 A.M. He takes Srila Prabhupada's pulse and states that the pulse is perfectly normal again. Kaviraj says that he has seen many, many patients, but never one with a body like Srila Prabhupada's. One day everything will seem to be in disorder, but the next day everything will be perfect again. Today there is no more high blood pressure either. Kaviraj says that he will have to go to Jaipur to get the ingredients for a special medicine. He is sure that if Srila Prabhupada will continue to take milk, take the medicine (when it becomes available), and (one other thing I couldn't hear), then Srila Prabhupada will be well. Kirtan starts quietly, and most of us leave the room with Shastri-ji. At about 3:50 P.M. I re-enter the room. There are about 10 devotees singing a nice kirtan for Srila Prabhupada. Shortly thereafter, another devotee and I are given a chance to lead the kirtan. He is playing the harmonium, and I accompany him with a pair of karatals. We sing continuously until 7:00 P.M. During this time Srila Prabhupada asks to be seated up in bed!!! He not only sits up in bed, but also accepts a portion of choody noodles! He chews just a little bit of it, and, after he is done, Upendra carefully distributes to us that which is left on the plate. Needless to say, the devotees in the room waste no time in honoring the Maha Prasad that has come right off the plate of the pure devotee! Srila Prabhupada is always giving to us, no matter what his apparent condition. Upon entering the room at 1:00 A.M., I prostrate myself near the bed, and offer obeisances to our Spiritual Master. The room is completely silent except for two sounds: the very faint sound of Srila Prabhupada's breath as he sleeps, and the slight rustle of Bavananda's beads as he chants silently. There are four of us in the room: Srila Prabhupad, Bavananda Maharaj, Giriraj, and myself. I take the opportunity to chant silently. Srila Prabhupada sleeps well for awhile, but then he awakens. He begins to have more trouble with his body. Bavananda does everything that he can----rearranging pillows, massaging, moving Srila Prabhupada, changing the blankets, but no matter what, Srila Prabhupada is still not doing well at all. Bavananda gives the order the go wake up Upendra. Upendra is here in no time and takes care of things nicely enough that Srila Prabhupada calms down and goes back to sleep. He sleeps well from 2:00 to 3:00 A.M. Then he wakes up again. For awhile he is cold, but then the quilt which is put on is too heavy, and He asks that it be removed. He even pushes strongly against it. His left leg is in pain, and he asks to be helped to pass urine. Things go from bad to worse. He insists that all covers stay off. We get Upendra up again, but then, in addition, we have to rush for Shastri-ji and get him up too. There are more devotees in the room now too, since many are now getting up early in order to chant some rounds before mongala aroti. In the middle of all this action, Srila Prabhupada erupts with a very loud and distinct "Hare Krishna". At that, Bavananda starts too chant out loud, but due to the attention that he is giving Srila Prabhupada, he stops chanting a few minutes later in order to concentrate on what he is doing for Srila Prabhupada. At that, Srila Prabhupada again erupts with "Hare Krishna!" and Bavananda chants even louder. Five minutes later, another "Hare Krishna!" from Srila Prabhupada, and at that point Upendra turns around to us and says, "You may all chant japa out loud". Kaviraj takes the pulse, looks over Srila Prabhupada, and then leaves. Srila Prabhupada becomes a little quieter. I leave at 4:15 A.M.
At 6:45 A.M. I re-enter the room. About 20 devotees are being led in a nice kirtan by Satswarup Maharaj. Srila Prabhupada is now worse. Now he has a cold, too. Now a cold on top of everything else. Srila Prabhupada's sister arrives, dressed all in white, and goes to the head of the bed to see her brother. She reaches out her hand to give him a long, consoling touch. She then proceeds to the foot of the bed, reaches under the covers, and touches his feet before she leaves. At about 8:30 A.M. I leave the room. At about 9:00 P.M. I re-enter Srila Prabhupada's room. There are about 15 to 20 devotees gathered around the bed including Kaviraj and another elderly gentleman friend of Srila Prabhupada. Srila Prabhupada is being massaged on one leg with looks like an oil of some kind, and a compress is being applied to the other leg. He doesn't seem to be doing well at all. Many devotees are staying and not leaving to take rest. At about 10:30 P.M. He begins to sleep very well. He is on his left side and sleeping silently. By 11:00 P.M. there are only four disciples left in the room: Swarup Damodara, Jagadisha Prabhu, a bramacari(who is reading under a lamp in the corner), and myself. Swarup Damodara is sitting quietly in the corner keeping an eye on Gurudev; Jagadish is seated quietly against the wall; the bramacari is reading; I am chanting Hare Krishna. At this point, the only sound in the room is Anantacarya whispering the Hare Krishna Mantra. The night is getting cold outside, and Swarup Damodara wants to stop a cold draft which is coming in on Srila Prabhupada by way of a French window near the bed; but it won't close. So I go outside and push while Swarup Damodara pushes from the inside. Somehow or other we manage to get it closed without waking up Gurudev. Later on, at 11:40 P.M., Srila Prabhupada awakes and asks to be rolled from his left side onto his back. Swarup Damodara helps him roll over to His back, then gives Him his medicine, and then fixes him up with the urinal. While He is being moved to his back, Srila Prabhupada's feet become uncovered, so I go over and tuck in Gurudev's lotus feet under the blankets. It is now 12:15 A.M. Gurudev is still sleeping soundly. Bavananda shows up promply at 1:00 A.M., and he takes up his vigil in the chair by the foot of the bed. At this point I take the opportunity to also go over close to the bed so that I can be closer to Srila Prabhupada while I chant the Maha Mantra very softly. For the next hour and a half I stand right there, next to Gurudev, looking at his lovely head and face. He is resting so nicely, and for that hour and a half, I can't see anything else. I stand in one spot and meditate upon his lotus face and head. Bavananda gets up and goes over to sit by the far wall with some other devotees who have now begun to arrive in the early morning hours. (It is now about 2:00 A.M.) So somehow or other I am alone at the bed with Gurudev as I chant softly for Him. Little do we suspect that this will be the last night that we will be able to be with our spiritual master by his bedside. It is now about 2:30 A.M. and, insofar as there are more devotees in the room to keep Srila Prabhupad company, I depart from the room. All Glories to our inconceivably merciful and infinitely wonderful Spiritual Master! At about 10:15 in the morning, I am passing by the windows of Srila Prabhupada's room and hear a loud kirtan going on in the room. Due to the strength of the kirtan I find myself thinking that now Srila Prabhupada is feeling better, but shortly later one of the devotees tells me that his condition is as critical as ever. Again at about 12:00 noon I pass the windows and the kirtan is still good and strong. Prasadam today is at 1:15 P.M., and as we are taking prasadam, a server walks into the center of the prasadam room and says, "I don't know how many of you have already heard about it, but Kaviraj has said that Srila Prabhupada has only five more hours in his body". At that announcement I begin to gulp down the remaining prasadam on my plate and then double time to Srila Prabhupa's room. I am afraid that the room will be so packed that I will be too late to get inside, but upon arriving, the room is about 1/3 filled with 25 to 30 devotees who are gathered close to the bed, chanting strongly. Our Spiritual Master is in what looks like a coma: He is not moving: His facial expression is like that of a trance. He is lying on his back with his head tilted back and to the side. His lips are parted, but there is no movement, and his eyelids are closed down tightly. Gurudev's bed is a nice large bed. It is sizeable enough that, even though Gurudev is lying in the middle of it, there is plenty of room for several devotees to sit on the bed along side of Him. Upendra, Bavananda Maharaj, and other close disciples of Srila Prabhupada are seated on the bed. Caru das, the president of the Berkeley Temple, is seated on the floor at the foot of the bed, massaging Srila Prabhupada gently. Tears are coming down his face as he gently strokes the legs and feet of his Spiritual Master. Other devotees are crowding around all sides of the bed, getting as close as they can, and singing kirtan continuously. All Srila Prabhupada's personal servant's are in attendance and they have worried looks on their faces(Bhakta Caru Maharaj, Upendra das, Bavananda Maharaj, Swarup Damodara das). The room is starting to fill up fast as the word gets around the Mandir about what Kaviraj has said. Everybody is now pouring into the room to chant for Srila Prabhupada---brahmacaris, matajis, children from the Gurukula, Sannyasis, visitors,---everybody. Hamsadutta Maharaj sits on a corner of the bed down by Srila Prabhupada's feet, and takes over the kirtan. He leads the kirtan nicely and keeps up chanting the right prayers(Pancha Tattva Maha Mantra, Hare Krishna, Samsara Dava). He asks for a prayer book and then leads us in the complete set of Govindam Prayers. We don't know all the words, of course, but he is singing them, and then we all join in for the refrain(Govindam Adi Purusam, Tam aham bajami---). The room is now getting stuffy because so many devotees are packed in. We open all the doors and windows and turn on the fans. More people from outside the Mandir are now showing up. Srila Prabhupada's sister is already here, seated on the floor next to the bed. For the many hours to follow, she almost constantly remains close to him. No matter what happens next, she will do her best to hobble along to be with Srila Prabhupada. Some of Srila Prabhupada's elderly vaishnava friends are arriving and a bench is brought in for them to sit on. The room is jammed. Kirtan goes on without ceasing as Hamsadutta leads us through the afternoon hours. The afternoon is filled with devotees coming and going and chanting. Some of the elderly Vaishnava gentlemen later on decide to leave, but the real frail short one stays on, sitting politely on the bench and quietly chanting japa. A real Vaishnava gentleman, chanting Hare Krishna continuously. Will I ever, in this lifetime, be able to appreciate what a merciful privilege it is---to be allowed to associate with the wonderful Vaishnavas in this room? At 5:00 P.M. Kaviraj arrives and proceeds to the bed. The devotees crowd close. In no time he has searched for Srila Prabhupada's pulse, but then reaches for his stesthoscope. He moves it around from point to point on Srila Prabhupada's chest and midsection, and then says something to Bhakta Cara Maharaj with a worried look. Only a handful of devotees could actually hear what Kaviraj said, but somehow or other the word is passed around--only 3 more hours, that's all. Kaviraj asks that some of Srila Prabhupada's books be placed nicely around his head on the pillows and some pictures of the Dieties also be placed on the pillows at the head of the bed. The books are placed nicely, and the diety pictures are now leaning against the pillows and bedstead. There are also japa beads lying near his head. So his lovely head and face are framed with some of his favorite transcendental paraphernalia. It is so beautiful to see the head of Gurudev surrounded that way. By now it has sunk into us what is happening, and Pradyumna and others have begun preparations for the Samadhi. There is talk of palanquin, fresh saffron cloth, garlands, etc. Hamsadutta looks very worried but keeps right on going with dedication and devotion. Srila Prabhupada is now occasionally swallowing with his mouth closed. His breathing is noticeable by the slight rise and fall of the sheet which covers his frail body. He is given some kind of liquid by Bhakta Caru, but I am too far away to see exactly what it is. From 5:00 to 6:00 P.M. I am appointed guard duty and sit in the vestibule. People from the town are arriving, and I can't tell who to let in and who to keep out. Everyone is extremely determined to see Srila Prabhupada and beg to please be let into the room for one last Darshan with him. At 6:00 P.M. I leave guard duty and re-enter the room. Now even the Matajis are crowding right up to the bed in order to be as close as possible to Srila Prabhupad. ISKCON photographers are carefully taking photographs and motion picture films. As before, may of us are crying. As for Bavananda, his eyes are continuously filled with moisture. Upendra too. We are all pressing toward the bed to see Gurudev. Now he is motionless again. Kaviraj walks in at about 7:50 and goes to the bed. He bends over for the pulse and we all push forward even more. I cannot see what is going on, so I stand on a chair in the back of the room, but still I cannot see Srila Prabhupad. But I can see Kaviraj, and instantly upon checking for the pulse he says something swiftly like "finished" or something to that effect. He (or Tamal?) immediately gives the order for loud, loud chanting of the of the Hare Krishna Maha Mantra. We all erupt with the Hare Krishna Mantra with an almost hopeless frenzy. Now it really begins to sink into us what has happened. Kaviraj has said that it's all over. Many of us start sobbing. There are devotees frantically chanting, crying, sobbing, breaking down completely. One boy goes into a crying convulsion and has to be dragged to a corner where he collapses in convulsive sobbing. Devotees are crying, sobbing, chanting, and running in every direction. Tamal orders us to leave the room. I go upstairs to cry alone. The night is filled with close and distant sobbing, women wailing, bells ringing, and even the dogs are barking and howling. I go back downstairs about 3/4 of an hour later. No more matajis, children, or visitors are present. The devotees in the room are now the saffron clothed ones. Mostly leaders in the Hare Krishna movement. Kirtan is continuing nicely. Srila Prabhupada has already been clothed nicely in saffron, garlands of flowers are placed on him, and a lovely bouquet of Tulasi manjaris is laid across his chest. There is sandlewood pulp covering his forehead and a large tulasi leaf fixed in the middle of his forehead. His skin has now turned pale, but one look at that powerful face and you know that whatever are the conditions, He is still the boss, still the Spiritual Master. Saffron material is now covering his form, and a saffron colored "swami" hat is covering his head. We bring in the palanquin, and he is picked up from the bed by four or five devotees and placed securely in the seat of the palanquin. Other Vrndaban Vaishnavas now come back in, led by Narayana Maharaja. They pay their heartfelt obeisances, and place flower garlands around their beloved friend. They are clearly much affected by the departure of Gurudev, and offer their most reverent obeisances to him. At this point I am crying almost all the time. Tamal Krishna states the plan for the next couple of hours: "The palanquin will now leave for the Temple Room where Gurudev will see the Dieties and an Arotik. Then a Gurupuja, an offering of flowers by devotees, and then chanting until the samadhi is ready". The palanquin containing Srila Prabhupada is lifted, and with strong chanting is carried out of the room. Srila Prabhupada in his palanquin is then taken around the around the outside of the Krishna-Balaram Temple 3 times. Three times around the circumference of the Temple Building with the devotees following and chanting. It is a joyous, happy kirtan. Round and round the Temple with Srila Prabhupada, and then he enters the temple as our transcendental leader to see the dieties. First the palanquin is placed in front of Gour-Nitai with the devotees singing joyously for their Gurudev. On to Krishna-Balaram: and then to Radha-Krishna. The kirtan is strong and jubilant. Then the palanquin is lifted and Srila Prabhupada is taken around the inside of the Temple, then outside, and then re-enters again and is placed before the Krishna-Balaram Dieties for continued jubilant kirtan and dancing. The devotees are singing and dancing and circumnambulating the palanquin. The devotees circle close to the palanquin and drink in the nectar of close darshan with Srila Prabhupada. We go around many times, circling closely. Now the palanquin is lifted and proceeds to the Vyasasan where both palanquin and Gurudev are placed right on and in the Vyasasan. He is in his palanquin which is on the blue velvet asana, with lion figures on both sides. Gurupuja begins. Omkara dasa does the arotik while Hamsadutta leads us in a rip-roaring kirtan. Really rip-roaring. After the Gurupuja, we prepare for the offering of flowers (marigolds) to Srila Prabhupada. The first devotees to offer flowers and obeisances to Srila Prabhupada are: His sister; His Vrndaban friends; Tama Krishna Maharaj; then Upendra; Pradyumna, the ISKCON swamis and Temple Presidents. Some of the Gaudiya Math (?) offer garlands of flowers and decorative spiritual paraphernalia. We offer the marigolds by circling motions and then shower them on Srila Prabhupada. Then each devotee (after offering his flowers) prostrates himself before the Vyasasan. While this is going on, Narayana Maharaj leads us in a very, very nice kirtan. He is leading us so very, very nicely, and from his leading chant, one can appreciate how much he is devoted to Srila Prabhupada. After the men have offered flowers and obeisances, then the matajis offer. At the end, Tamal announces that the townspeople of Vrndaban have requested to please let them have darshan once more with Srila Prabhupada, so now instead of proceding directly to the samadhi, Srila Prabhupada will wait in the Vyasasana during the night and then proceed to the seven temples of Vrndaban in the morning. After the parikram of Vrndabn in the morning, He will return for samadhi. We are ordered by Tamal to stay up all night with Gurudev for continuous kirtan. Srila Prabhupada is now being fanned by camara while the kirtan goes on. IT IS NOW 12:30 A.M., 15 NOVEMBER 1977. The kirtan goes on, and the nightime is beginning to get very cold. By 1:30 A.M. the population in the temple room is beginning to thin out and there are only a few of us who are actually doing kirtan. There are about 20 to 30 devotees in the temple room, but many are chanting japa. I am beginning to get tired myself, so I quickly dash upstairs for a cold shower and then dash back to the kirtan. At about 2:00 A.M. the air has become penetratingly cold. Four or five of the younger "Indian" ISKCON devotees and myself are now clustered together up close to the Vyasasan in order to keep the kirtan going strong. Also up by the Vyasasan are two of the older dedicated "Indian" devotees who refuse to leave Srila Prabhupada even though they can hardly stay awake, and no matter how cold it gets. The little frail one sits motionless in front of the Vyasasan with only a chowda wrapped around his shoulders. Pradyumna sits with us and chants on his japa beads. He is looking quite worn out, but stays with Srila Prabhupada. The "Indian" ISKCON devotees lead the kirtan and keep it going nicely. Also, there are a few matajis in the rear of the temple room, chanting japa. Viraha Prakash Maharaj is now standing at attention by the side of the Vyasasan steps. About 3:00 A.M. I am asked to fan Srila Prabhupada with one of the Camaras. I step up next to the palanquin at Srila Prabhupada's right side and relish every moment of being able to whisk Srila Prabhupada. I am talking to him silently, and the tears won't stop rolling down my face. It is just dark enough that the devotees (I hope) cannot see that I am crying. Srila Prabhupada is so kind that even though he finally decides to leave us, he still mercifully stays with us for an extra night so that we may have one last chance to see His Divine Form, chant kirtan for him, and whisk him with the Camara. By 4:30 many of the devotees are beginning to return to the temple room. Srila Prabhupada's sister also returns at this time and politely sits on the floor near the vyasasan. She obviously wants to sit even closer to Srila Prabhupada (on the mats up front with us) but this carpet is filled with male devotees, so she humbly sits down over to the side on the cold floor, next to one of the pillars. At this point the women come forward and offer incense to Srila Prabhupada. At 4:45 I volunteer to whisk Gurudev again, and take the left side this time. How nice it is to be able to fan Him during his last hours with us. By 5:00 A.M. everyone is back. As mongol arotik starts a little later, many devotees turn their backs to Srila Prabhupada in order to pay prostrated obeisances to the Dieties. Narayana Maharaj and his associates remain motionless and do not budge. In no time at all, Narayana Maharaj is laying it on the line to Gopal Krishna Das---the devotees are to stay at the Vyasasan facing Srila Prabhupada, and there is to be a simultaneous arotik for Srila Prabhupada at the Vyasasan while the arotik also goes on for the Dieties. Gopal Krishna quickly gets everything arranged nicely, and a nice arotik is held at each of the three altars plus at the Vyasasan. Narayana Maharaj leads the kirtan and winds up everything with repeated and resounding "Jaya Gurudevas", one after another. Afterward, there also is an arotik for Tulasi Devi. The Parikram begins at about 6:45 A.M., and the palanquin is lifted from the Vyasasan and carried to the center of the courtyard of the templeroom where we circumnambulate Srila Prabhupada with more chanting, of course. We then proceed through the front gate of the Mandir, down the road to Vrndaban, and parikram to each of the (7)? Temples of Vrndaban. Narayana Maharaj is arranging everything nicely, leading the procession, leading the kirtan, and seeing with great attention that everything goes along perfectly for our Gurudev. Narayana Maharaj is now conducting the parikram, acting on our behalf as our very capable leader, and seeing to it that everything is conducted nicely for Srila Prabhupada. For the next 6 hours, he is indefatigable, watching everything, and continuously providing the devoted and competent leadership needed so that all the details of the parikram and samadhi are executed perfectly. It certainly is quite an impressive procession as it moves along down the road. The procession actually consists of two parts. First, there is a large group of devotees consisting of Narayana Maharaj and most of the Sannyasis (and others, too). This group leads the procession and also leads the strong kirtan. Then there is a gap of about 20 yards to the next group which consists of the Palanquin with Srila Prabhupada, the palanquin bearers, close attendants, devotees, and others. Immediately following this group are the matajis, and then several rickshas carrying Srila Prabhupada's Sister and some of the children from the Gurukul. There are eleven dandas gliding through the air. When one looks toward the palanquin, he usually sees Citsukananda bearing the load up front and Vishnu Tattva Das supporting the rear of the palanquin. Although they are from time to time temporarily relieved, these two boys are seen carrying the heavy palanquin for most of the procession. And it is indeed heavy. Some boys who try to carry it cannot even get the carrying bar up to their shoulder so that it can move, and, as a result, are not able to share in this mercy. 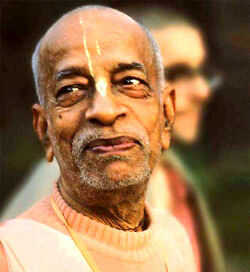 For the entire procession, Bavananda Maharaj is inseparable from Srila Prabhupada's side. Tamal Krishna is also there at the palanquin, taking part of this part of the procession and giving the directions and leadership to the second group of devotees. From time to time the going gets a little rough. At this, there is anxiety written all over Upendra's face, because there isn't much that he can do about it. Nevertheless, Srila Prabhupada and his devotees sail through the streets of Vrndaban. The streets are lined with people shouting "Hari Bol!" "Hare Krishna!" "Jai Gurudev!". Families are coming out on the rooftops to see the procession, and the townsfolk of Vrndaban, young and old, are paying standing obeisances to Srila Prabhupada. We stop in front of each of the Temples and there are resounding "Jai Gurudev"s.
At one point on the road (not to far from the mandir) there is a young woman standing at the side of the road watching the procession go by. After the last devotee walks by, her eyes begin to get wide, and they light up with amazement and veneration. She follows the procession down the road with her eyes, and then turns and walks to the center of the road. She bends down, and with hands outstretched, palms down, she rubs her hands in a circular motion in the dust. Lifting her hands she then, again in a circular motion, smears the dust of the lotus feet of the Vaishnavas all over her cheeks. At that point, with eyes still as wide as large coins, she beams with a smile, and with that smile radiates to us that she understands that it is not everyday at 7:30 in the morning that a person gets a chance like this!!!!! A little farther down the road, another young woman, dressed in the finest of exquisite garments, steps from her house into the street ditch in order to see the palanquin go by. When she recognizes who is in the palanquin, then, regardless of the finery she is wearing, she immediately bends her knees into the gutter, brings her head and arms to the ground, and pays obeisances to Srila Prabhupada. How is it possible to keep from crying when one sees just how much Srila Prabhupada is loved and revered by everybody. We return to the Mandir, and the samadhi begins immediately. Srila Prabhupada has a bathing ceremony, a change of garments, flower garlands, puja offering, prasadam offering, and is finally covered with salt and then sand. It is a lengthy and beautiful ceremony, and does not terminate until 1:00 P.M. in the afternoon. The temple bell is ringing continuously, and the kirtan goes on without interruption. At about 1:00 P.M. the samadhi ceremony ends, and the devotees take Prasadam. These pages began as a diary---but somehow or other turned into something like a partial report of some of the details of the past few days. In consequence, even though it is clear that I am certainly not competent to write about those events, I am begging the mercy of our Gurudev and the Disciplic Succession to allow me to write down as a diary this little bit of information for those devotees who were not able to be with their Spiritual Master during his last days with us. Please, Srila Prabhupada, forgive my offenses. It is only by your mercy that I can possibly do anything. You have given me so much, and I have given you so little. Srimate Bhaktivedanta Swamin iti namine. subject: Re: Hoy to tai. Dandavats. All Glories to Srila Prabhupada. >Srila Prabhupada: Ye sab friends. TKG: "…going down..(Bhavananda giggles)..The poison's going down." Only hours earlier, His Divine Grace had made it clear to Tamal Krsna, that he believed poison was being administered via his food. This prompted Tamal to say: "Ah, I see. That's why we cannot allow anyone to cook for you." Since Tamal was in charge of Srila Prabhupada's meals, medicines and just about everything else, we can easily understand his hurt, directly or indirectly by Prabhupada's convictions. When we add to this, previous accusations of medicines containing poison, Tamal was sitting in a proverbial hot spot. Understanding Tamal's commitment to Gurudev and seva, it should come as no surprise that he became cynical. And that's what prompted him to whisper.." The poison's going down". There really was no poison in the milk at all. But more importantly, that is why Bhavananda giggled: he knew Tamal was being cynical, nothing more. But what neither of them realised is that Srila Prabhupada had heard them, and Tamal's cynicism would end up sounding like murder. Sākṣī Dāsa first saw Śrila Prabhupāda in 1971 in his hometown, Kolkata, India. He was initiated 11 years later in Melbourne, Australia where he still resides.